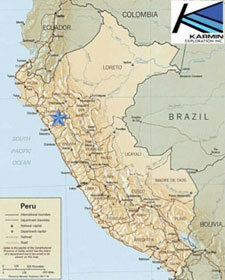 On February 15, 2012 Karmin acquired 100% of the right, title and beneficial interest held by Alberto Aurelio Arias Davila (the “Vendor”), a well-known Peruvian mining entrepreneur and an arm’s length party, in two mining concessions (the “Purchased Mining Concessions”) forming a portion of the Cushuro Property located in the department of La Libertad in the Republic of Peru (the “Acquisition”). Karmin entered into a separate agreement to lease (the “Lease”) an additional mining concession from the Vendor (the “Option Mining Concession”, and together with the Purchased Mining Concessions, the “Cushuro Mining Concessions”), also forming a portion of the Cushuro Property, providing Karmin with access to the Option Mining Concession during the Option Term. Pursuant to an option agreement (the “Option Agreement”) with the Vendor, Karmin was granted an irrevocable and exclusive option (the “Option”) to purchase from the Vendor 100% (and not less than 100%) of the right, title and beneficial interest in the Option Mining Concession (the “Option Acquisition”, and together with the Acquisition, the “Cushuro Acquisition”), exercisable at its sole discretion, at any time on or after January 16, 2012 and for a period of one year following such date (the “Option Term”). Karmin intends to issue a news release if and when it elects to exercise the Option. In connection with the closing of the Acquisition and the entering into of the Lease, Karmin issued an aggregate of 14,865,000 common shares of Karmin to the Vendor, representing approximately 27.55% of the total issued and outstanding common shares of Karmin, which resulted in the Vendor becoming a Control Person. In the event that the Option is exercised, an additional 135,000 common shares (the “Option Shares”) of Karmin will be issued to the Vendor on closing of the Option Acquisition. If issued, the Option Shares would bring the Vendor’s aggregate holdings to 15,000,000 common shares of Karmin, representing approximately 27.73% of the common shares of Karmin that will then be issued and outstanding. The closing price of the common shares of Karmin on November 21, 2011, the trading day immediately preceding the execution of the Purchase Agreement and the Option Agreement, was $0.69 per common share (the “Share Price”), resulting in the total value of the consideration paid in connection with the Acquisition to $10,246,500.00. Based on the Share Price, the total value of the consideration paid in connection with the Lease was $10,350.00. If the Option is exercised, based on the Share Price, the total value of the consideration to be paid in connection with the Option will be $93,150.00. Assuming the Option is exercised, and, based on the Share Price, the aggregate consideration paid by Karmin to the Vendor in connection with the Cushuro Acquisition will be $10,350,000.00. The Cushuro Project spans an elevation range of 3,900 to 4,200 meters, can be reached in 4 to 5 hours via well-maintained roads from Trujillo (a Departmental Capital on the Pacific coast), and is crossed by a power transmission line. 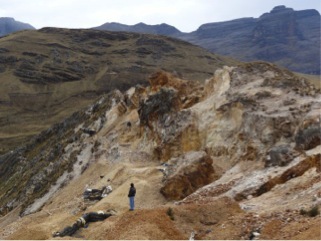 Although there are other zones of mineralization on the Cushuro Project, including meter-wide veins yielding multi-ounce silver assays (Zona Escalerillas) in the southern part of the property, the main target is Zona Cushuro in the northeast sector of the property, where anomalous gold is associated with highly fractured and/or brecciated Chimu quartzite. Geothite and hematite typically infill steeply dipping fractures and form the matrix of breccias. Silicification occurs as matrix inundations and as discrete quartz veinlets. Bedding strikes are north-northeasterly, parallel to the trend of the zone, and dips are 30° to 35° east. Regionally, bedding strikes are north-northwesterly, which suggests that the anomalous strike direction of the Cushuro beds is related to structural deformation. Zona Cushuro is about 560m long, 150m wide, and spans a vertical interval of about 60m. The zone covers approximately 10 hectares and is open to the south (where gold- in-sediment anomalies suggest an extension) and west. During 2004 to 2006, Minera IRL took 621 rock samples from Zona Cushuro. Most of these were 6-m-long channel samples. These rocks returned an average grade of 755 ppb gold, top-decile grades of 1000 to 87,000 ppb gold (1g/t to 87g/t gold) and a median gold value of 70 ppb. Basically, the Cushuro gold-in-rock geochemical anomaly can be described as a zone of geochemically anomalous gold assays (several tens to several hundreds of ppb gold) punctuated by randomly distributed “Bonanza-grade” (multi-gram) assays. Although the rock geochemistry shows that there are at least two trends of mineralization; a strong one that trends north-northeasterly parallel to bedding and the long axis of Zona Cushuro, and a weaker one that is north-northwesterly trending and at a right angle to the first; it does not look as though the higher-grade values are confined to one, or two, or even several continuous and distinct structures. Rather, it seems that there is a random nugget effect controlling the distribution of “Bonanza” (multi-gram) gold assays. This suspicion is supported by the irregular distribution of cyanidation pools, which are constructed by the few “informal miners” who have been working at Zona Cushuro for several years. The “informal miners” need a grade of at least 5000 ppb (5 g/t) gold in order to realize a profit, and the cyanidation pools have to be near the source of the ore-grade material in order to reduce transportation-related costs. In 2004, Minera IRL successfully drilled 6 shallow holes totalling 341.5 meters (other attempted holes apparently had serious recuperation problems). The best assay results were from hole DDH 5, which intersected 46.45 meters grading 0.534 g/t gold between 16.0m and 62.45m (end of hole). 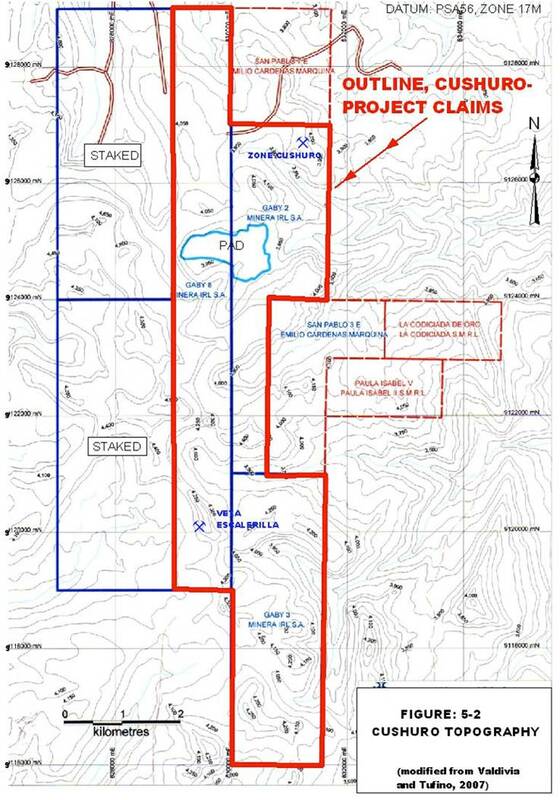 This included a 12-m segment between 36.0m to 48.0m that graded 1.8 g/t gold, and one 2-m “Bonanza” assay of 8.4 g/t gold between 42 meters and 44 meters. Hole DDH 1 intersected 18 meters grading 0.16g/t gold between 10 meters and 28 meters, and did not have any “Bonanza” intercepts. The remaining four holes intersected scattered intervals of geochemically anomalous gold with no “Bonanza” intercepts. 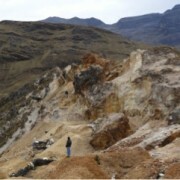 The author of the 43-101 technical report believes that the quantity of drilling done, particularly in a system with nugget-effect gold distribution and drill-core recuperation problems due to intense fracturation, was inadequate to realistically evaluate the economic significance of Zona Cushuro. The author is concerned that the drill holes were not correctly configured. Most drill holes were spotted at or close to the topographical summit of the Zona- Cushuro trend (directly on top of rock-geochemical gold anomalies), and were inclined westward in order to intersect east-dipping strata. This means that if the mineralization is stratigraphically controlled, and if the rock-geochemical gold anomalies are at the base of the stratigraphically mineralized system, then the drill holes would quickly pass out of the mineralized package and into barren foot-wall sediments. The drill holes should have been stepped out to the east in order to intersect stratigraphically higher parts of the mineralized system. 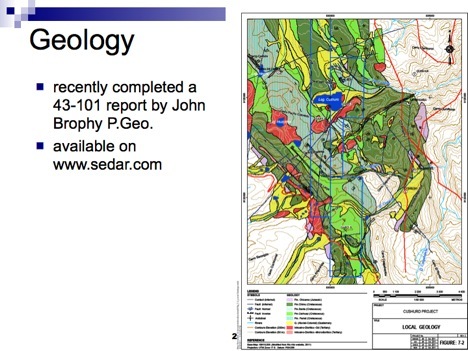 In this regard, it is interesting to note that the best hole, DDH 5, was stepped out further to the east from the central axis of the Cushuro gold-in- rock geochemical anomaly than any other hole except DDH 6, which itself was probably north of and outside of the mineralized zone. It is crucial to acknowledge, accept and deal with the significance of apparently random occurrences of “Bonanza-grade” (multi-gram) gold assays when considering any interpretation of the possible economic significance of Zona Cushuro. It is clear from the rock-geochemical survey that the Chimu quartzites are enriched in gold relative to average crustal abundances for sandstones. However, the rock-geochemical, drill-hole, and verification programs all indicate that “Bonanza-grade” assays are the exception rather than the rule. But, without careful consideration of “Bonanza-grade” contributions, interpretation of the economic significance of Zona Cushuro could be diminished from “economically intriguing” to “academically interesting”. It is well known that variation due to nugget effects can be reduced by increasing the weight and reducing the grain size of the field sample. In order to capture the “Bonanza-grade” segments that could impel the project towards economic viability, it is recommended that future drilling be done using large-diameter reverse-circulation methods that will collect voluminous samples that can be reduced to typical laboratory weights using a scientifically reliable splitting apparatus such as a Gilsen Splitter, and by studiously implementing a well-planned quality-control and quality-assurance programme. The image below shows the mineral concessions of the Cushuro Gold Project. The Cushuro Gold Project is located in the Huamachuco Gold-Mining District in the sierras of northwestern Peru as shown in the map below. Geophysical and Geology Studies are currently underway. It is expected that the technical work completed in late 2012 will be compiled, surface access agreements will be completed and that preliminary environmental permitting will be finished in preparation for a drill program in 2013.